Fog set over the Golden Bear, the maritime training vessel docked at California State University Maritime Academy (Cal Maritime), and served as the backdrop for NAMEPA’s and Cal Maritime’s “What’s In Your Stack?” event on January 11, 2019. 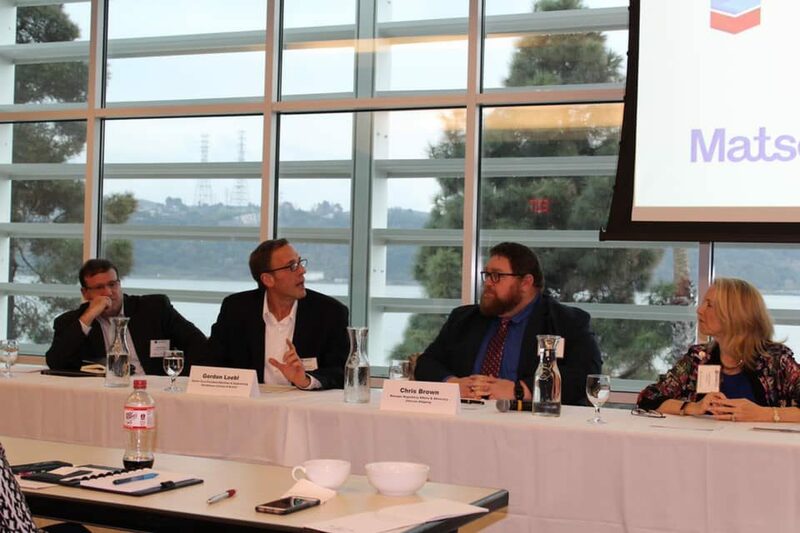 This was an industry forum on the rapidly changing “airscape” for ship emissions. The marine industry has seen a dramatic requirements to change its operational practices to meet regulatory and societal demands. Sponsored by Chevron, Holland America Line, Hornblower Cruises & Events, Matson, and The Viswa Group, this seminar was a unique and informative experience for students, regulators, industry representatives, and conservationists to foster meaningful discussion on the future of the regulatory framework for shipping challenges facing the industry, and options to reduce environmental impacts. Alex Parker, professor of Oceanography at Cal Maritime, welcomed the diverse crowd of over 60 industry leaders, conservationists, and cadets. 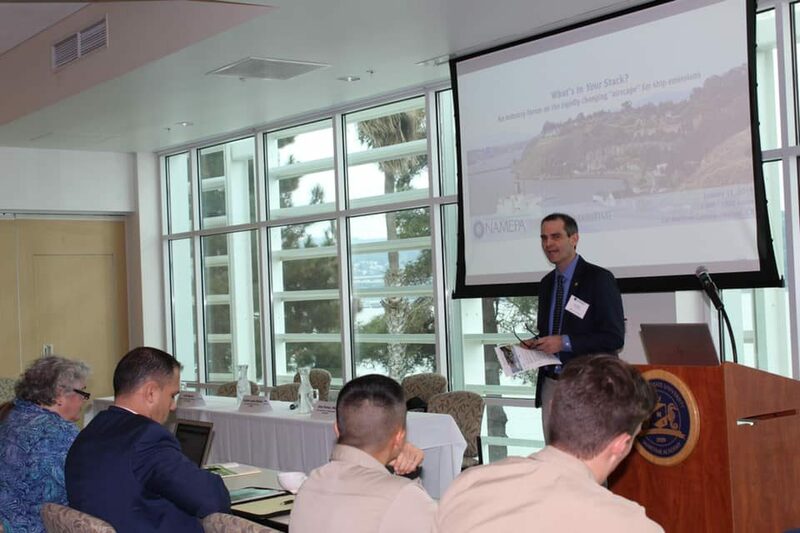 He emphasized that the goal of this event, and commitment to academic rigor at Cal Maritime, is to create an ocean literate group of cadets charting their future in the maritime workforce. 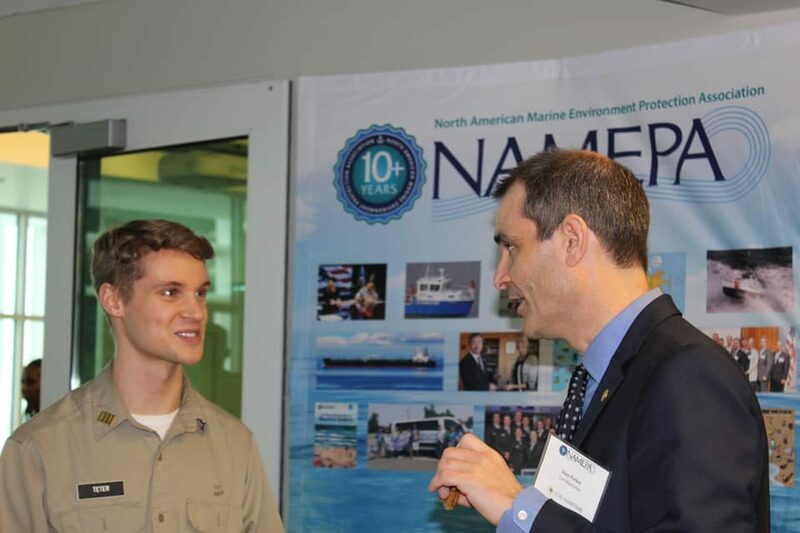 Cal Maritime currently runs a student-led NAMEPA Chapter in which they have advocated for the marine environment by planning community education and clean-ups. Carleen appropriately stated that sustainability in shipping is as disruptive as sail to steam and the invention of the container. Adverse environmental and public health effects from air emissions, the imminent sulfur cap, increased automation, shortage of trained mariners, shrinking ice caps, cyber-attacks, and a demand for alternative energy sources are some of the dynamic challenges facing the maritime industry today. “What’s in Your Stack?” addressed these issues by bringing all voices to the conversation. The forum introduced topics on the decarbonization of ports, electric and wind technologies, liquified natural gas (LNG), and strategies to reduce greenhouse gas (GHG) emissions. The necessity to balance commerce with conservation is more apparent with each passing day. The shipping industry is vital to global society and trade, transporting 90% of all goods and energy across the world. Equally vital is environmental conservation as overpopulation continues to jeopardize our precious marine environments and natural resources. We must all work together to Save Our Seas. So, the question remains, “What’s in Your Stack?”. A full photo album from the event can be found on NAMEPA’s Facebook page. PDF versions of approved presentations will be posted to the NAMEPA website.